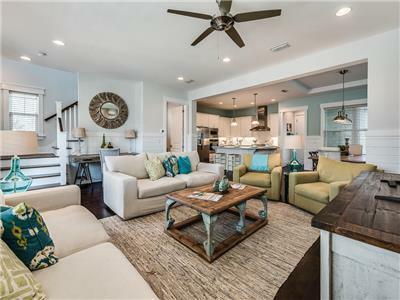 Come experience life along the Gulf, in this renovated, ground floor Beachwood Villas condo. 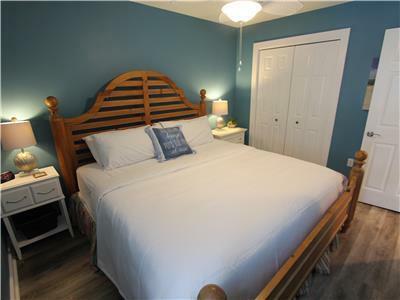 Offering comfortable accommodations for up to 4 guests in 1 bedroom and 1 bathroom. Pack your swimsuit, beach towel, sun tan lotion and add “FLIP-FLOPS”! 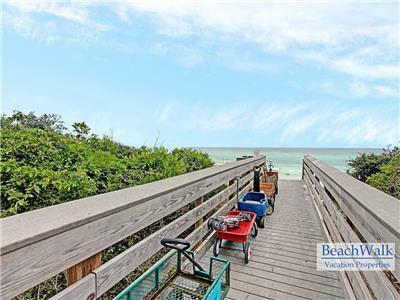 You are all set for a wonderful vacation in Seagrove Beach on Highway 30A! 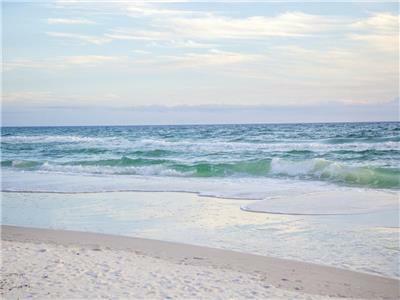 The white sugar sand beaches and turquoise waters of the Gulf are a short walk away. 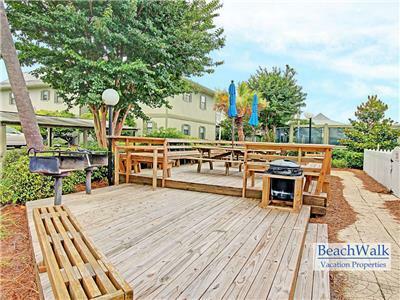 This condo is located on the first floor and has a lovely view of the lush courtyard at Beachwood Villas. 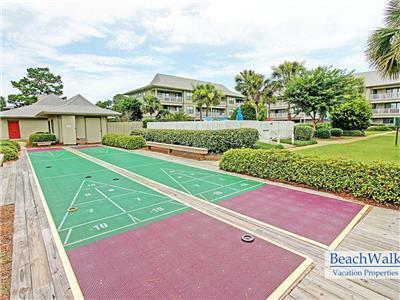 Follow the boardwalk to one of the two pools, play tennis on the lighted courts, or try your skills at shuffleboard. Grills and picnic tables are scattered throughout the eight-acre beautifully landscaped grounds. The community also has a fenced in playground for those under 6. 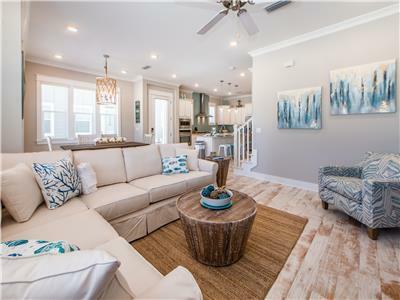 Freshly updated with coastal décor, “FLIP-FLOPS” features a queen sleeper sofa with memory foam mattress, 2 swivel chairs and an oversized ottoman. New flat screen TVs are in the living room and bedroom. Wireless Internet and a DVD player are provided for your stay. Seating for four at the dining room table and for two at the breakfast bar. The fully equipped kitchen has quartz countertops, flat top stove with oven, dishwasher, and stainless steel refrigerator with icemaker. 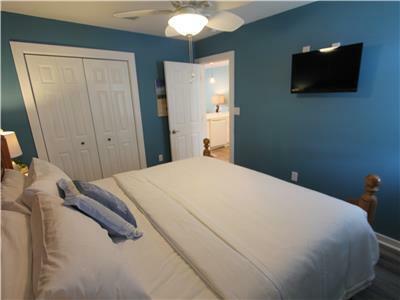 The bedroom has a king size bed, ceiling fan and a large closet. The large bathroom has a tub with shower, new vanity and sink. 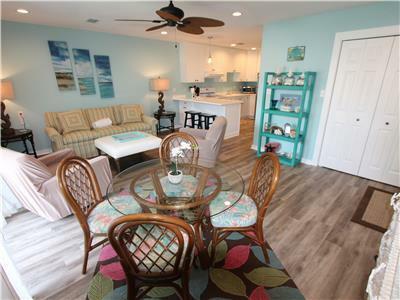 The owners of “FLIP-FLOPS” take pride in their vacation home and are constantly updating and improving the condo during their many visits during the year. 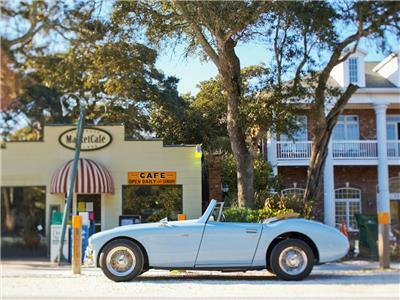 Enjoy the shops and restaurants along 30A! 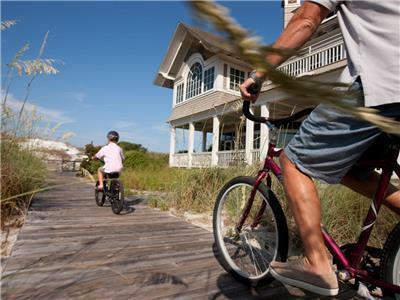 The bike/walking path that connects to Seaside, Watercolor, and Grayton Beach is across the street. 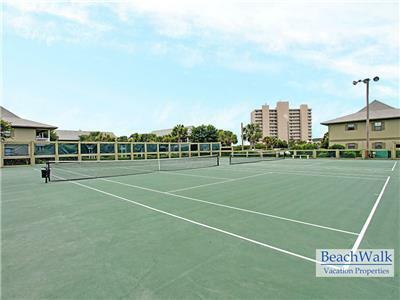 Beachwood Villas enjoys deeded beach access right across the street! Nearby restaurants to Beachwood Villas include Angelina's Pizzeria, Cafe Thirty-A, The Perfect Pig, 723 Whiskey Bravo, Cowgirl Kitchen, Pizza by the Sea, Steamboat Grill 30A and More! 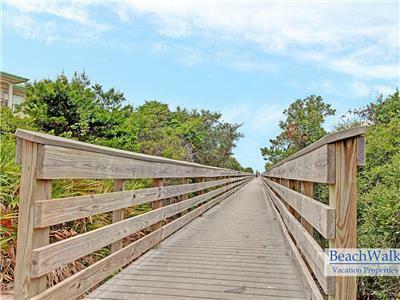 Seagrove Beach All Seasons Attraction 5087 ft.
NatureWalk All Seasons Attraction 1.19 mi. 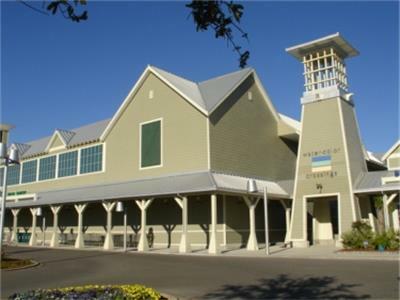 Publix Supermarket at WaterColor Crossings Grocery Store 1.26 mi. WaterColor	 All Seasons Attraction 1.47 mi. 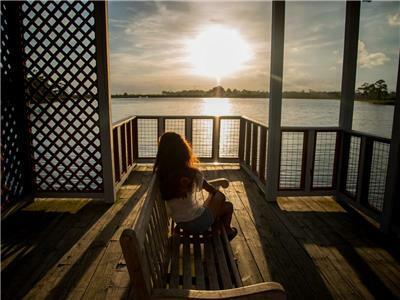 Seaside	 All Seasons Attraction 1.59 mi. 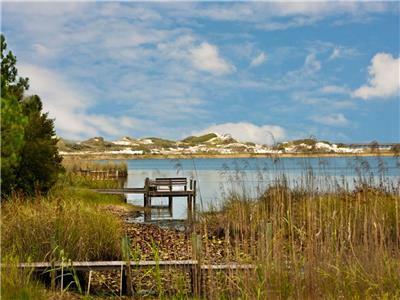 Grayton Beach All Seasons Attraction 3.26 mi. 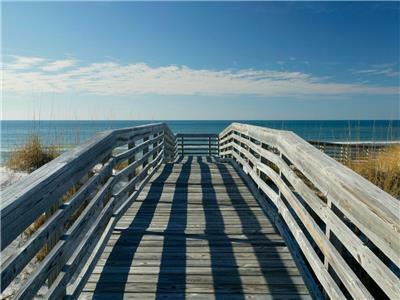 Seacrest Beach All Seasons Attraction 4.71 mi. Blue Mountain Beach All Seasons Attraction 5.24 mi. 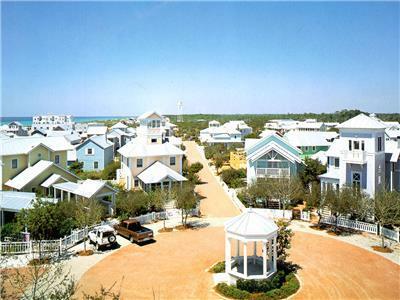 Alys Beach All Seasons Attraction 5.37 mi. WaterSound	 All Seasons Attraction 5.39 mi. This condo was perfect for a girls trip with my sister. 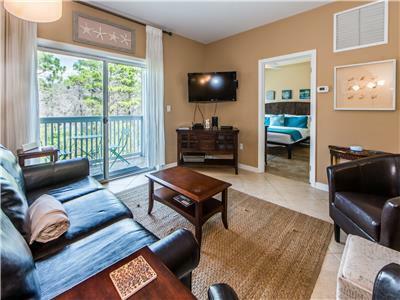 We love to be in seaside as much as possible while we are on 30A and this condo is just over a mile away. The bike rental place is next door so that was a huge plus too! I worried about the people upstairs but they weren't loud once bed time came. It's worth it to have the bottom floor-so easy to unload your car and load it when it's time to leave. 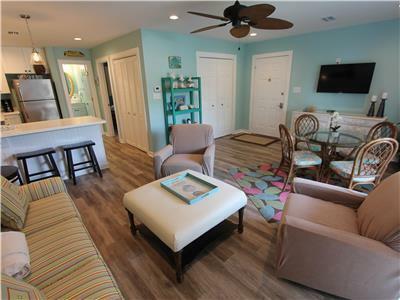 The decor is very beachy which isn't my favorite but it isn't a deal breaker for me. It's very clean and that is important! Washer and dryer was very nice to have. I have stayed in a unit at this location that didn't have them. We will rent here again! I would definitely stay at Flip Flops again. The condo was very nice and there was easy access to the beach. The condo definitely felt like a home away from home. They thought of everything to make our stay convenient and enjoyable. Great location, clean, nice amenities, but also quiet. We loved our stay, and hope to return to this property again. We loved our stay there. The only draw back was we could’nt get cbs on the TV at night. But we were able to catch up on our shows when we got home. The place has everything you need. Incredible location & Extremly well kept! Was able to stay at this location for 3 nights and it was absolutely amazing! The unit was very clean and decorated perfectly. This unit includes everything you will need. The property as a whole is a nice oasis. My fiancée and I are very active people so it was great riding distance to some of our favorite spots. Short bike ride to seaside and watercolor and surrounded by great food options. Beach access right across the street and with the Tom Thumb so close it made it easy for us to always have what we needed. We will definitely try and book this unit again for our next long weekend! Thanks for everything! 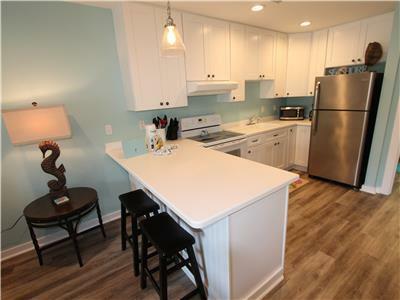 Cute little condo that has been updated nicely. The kitchen is light and airy. The master bedroom has a king bed and has nice storage in the closet. The bathroom was clean as well. The washer and dryer was a must but is unusual for some of the units in this complex. It was the reason we rented this unit and I'm glad we did. All in all, it had everything we needed and was close to the beach. If I have any complaints at all it's just that the furniture was outdated, otherwise it was great. Great location! Great decor! Overall fabulous experience! Would definitely rent again! My husband and I came for a weekend getaway. It was all so perfect. Beautiful, clean, and welcoming. This suite had everything we needed. 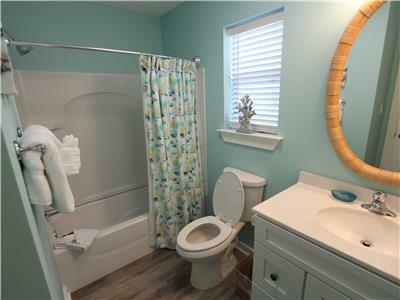 Well positioned to the beach, lovely town of Seaside, and nightlife in Santa Rosa. I will definitely visit here again. Thank you VRBO and Live Well! 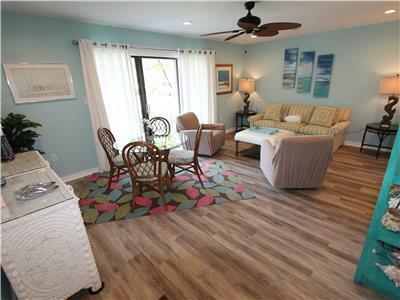 My husband and I stayed at the pleasantly remodeled Flip Flops Beachwood Villas Unit. 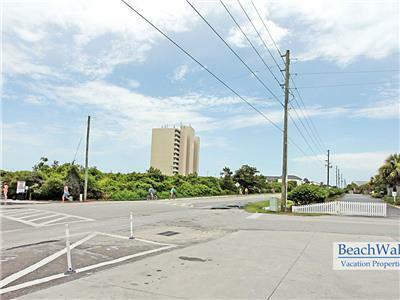 The only reason I gave it a 4 rather than a 5 is that it is not located on the ocean side yet the walk to the beach was manageable, just a few steps across 30A to the boardwalk (which is in very good condition). 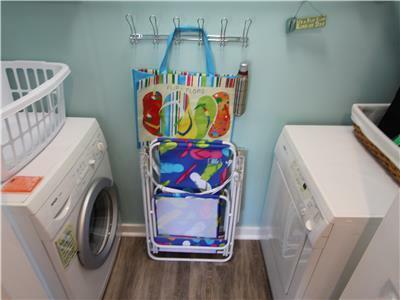 The small washer and dryer in the unit was very convenient. We enjoyed staying there. It was clean, comfortable and a good bargain. We would stay at Flip Flops again. 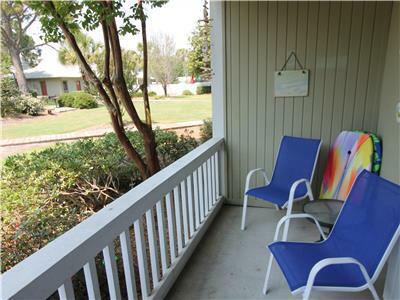 Very clean, close to the pool, short walk to the beach and convenience mart (Tom Thumb). Would definitely stay again! The condo was absolutely beautiful. It had everything you needed for a getaway. 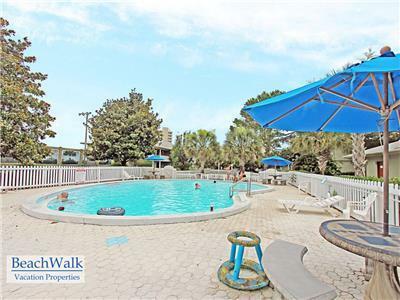 Within walking distance of numerous restaurants and the beach. 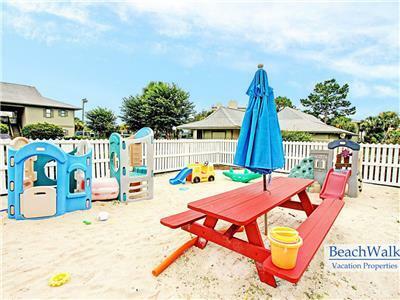 Great location and steps from the beach! Was able to book this well finished condo last minute for me and my husband. Wish we could have stayed longer! Would definitely recommend! Great little condo with lots of character! Really enjoyed our stay here . Decor was very welcoming and unit was fully furnished. Little noise upstairs but it's all good . 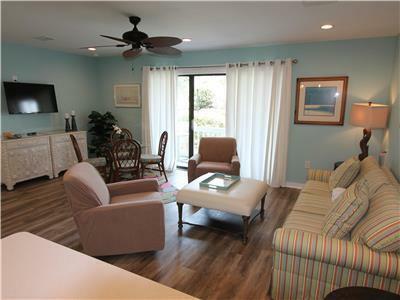 Beautifully decorated, comfortable condo convenient to the pool and beach! We had a wonderful time! My husband and I loved our stay here. It was right across the street from the beach access and right next door to a 24hr Tom Thumb that carries all the essentials should you need them. Not to mention the beautiful town of Seaside is a 5 minute drive. The pool areas were clean and easily accessible. I also appreciated all the kitchen supplies and that the unit had a washer and dryer. The bed is also super comfy. We look forward to our next stay! Flip Flops was so comfortable, clean, beautifully decorated and had everything we needed for our beach stay. We loved the pools and kids playground as well as the location. We will be back! My hubby and I loved this place! It was a quiet condo but within walking or biking distance of everything! We loved returning to it after the beach or a hot day out! Has all the necessities (plus a boogie board we left). Wish we could've stayed longer! And hope to return soon! We found the place in immaculate condition and with the electronic lock making entry convenient ( no extra key to carry around). The condo was very well stocked with all the kitchen utensils, dinnerware and cookware. The bathroom was roomy and well equipped with towels. The TVs were up to date and well located. The patio faced the central garden area and was very relaxing while enjoying the afternoon sun. 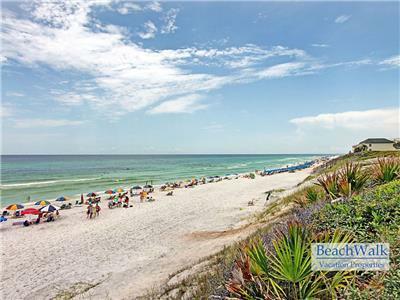 The gulf is within a 5 or 6 minute walk with a beautiful white sandy beach. A grocery store is located only a mile away and there is a Tom Thumb gas/convenience store next door. There are tons of restaurants nearby. 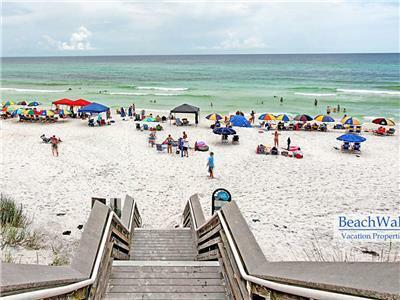 Destin and Panama City Beach are a short drive away if you need anything special and also remember to bring your golf clubs. There are numerous courses to play. I highly recommend this condo and looking forward to the next visit.